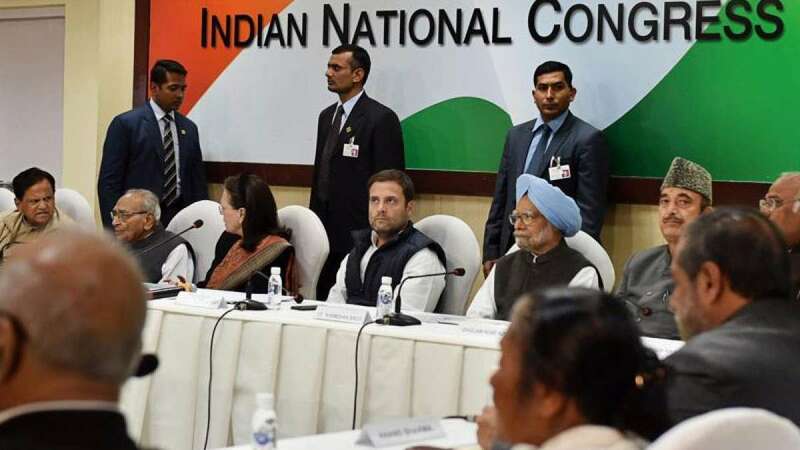 New Delhi : Rahul Gandhi on Friday chaired a Congress Working Committee (CWC) meeting, his first after taking over as party president, and launched a scathing attack on the BJP terming the ruling party's entire structure as "based on lies". With the Congress' spirits greatly buoyed by the party's good showing in the Gujarat polls and the 2G case verdict, an aggressive Gandhi said the people are questioning Prime Minister Narendra Modi and his remarks against Manmohan Singh, and noted that there was a "positive sentiment" towards the party in the country. He also hit out at Prime Minister Modi for his silence on the sudden spurt in the business turnover of BJP President Amit Shah's son Jay Shah. "The entire foundation of the BJP is based on lies. The whole architecture of the BJP is about lies," Gandhi told reporters after the meeting. He targeted the BJP over various issues, including an alleged scam in the Rafale deal, GST, demonetisation and "lying about the so-called Gujarat development model". "It is stealing of resources of people of Gujarat. Whether it is depositing Rs 15 lakh in each bank account, whether it is 2G, whether it is giving farmers proper remuneration, whether it is Gujarat model… one by one the lies are coming out," the Congress leader said. "There are two other lies, very big ones." He questioned how the turnover of Jay Shah's company jumped from Rs 50,000 to Rs 80 crore "in three months" after the BJP-led NDA came to power in 2014. Referring to the 2G spectrum case, Gandhi said the court verdict saying there was no scam was a "vindication" of the Congress' stand. "Everyone knows about 2G, the truth has come out in front of you." Earlier, in his opening remarks in the meeting, Gandhi said the 2G case was "possibly the biggest instrument used against our government" which ultimately turned out to be "fake". "So the idea, their model, is to come up with a lie, spread that lie, and just keep repeating that lie until people believe the lie. And the good news that I can see is that people are now beginning to question it. Across the country, they are questioning Modi on the economy, they're questioning Modi when he insults our ex-Prime Minister. "So that feeling is coming up and there is a positive sentiment towards the Congress. So I think there is a lot of opportunity for us that we need to step into and take advantage of." He said the Congress had successfully dismantled the "Modi model of development" in Gujarat where campaigning for elections "was a real eye-opener" for him. "I got to see first-hand the way the BJP designs campaigns and how they use hatred and untruth to fight elections. I don't call it the 'Gujarat model' because it is not the 'Gujarat model', it is actually the 'Modi model'. I was surprised to see that it is universally understood by the people of Gujarat that this is a flawed, fake model." The 47-year-old Gandhi scion said he found that Modi has handed over Gujarat to a "few vested interests and he has taken tremendous benefits from Gujarat but Gujarat hasn't received anything in return". He said the Prime Minister in a "desperation" launched an attack against his predecessor Manmohan Singh based on "complete(ly) blatant falsehood and a lie". "(Modi) has had nothing to say about that since then."